I heard a (newer) member of the church say recently that she felt like she had grown closer to God since joining our community. That was music to my ears; one of my primary goals as a pastor is to foster spiritual growth. I am committed to helping each one of you to grow in your relationship with God. But she followed that remark with the observation that she didn’t really know how to get involved with any of the church missions. She was unclear about how to take that step. I understand her confusion. We have lots of mission projects, but they are a bit disconnected and disparate. Over the last couple of years, our church has taken significant steps in becoming more and more mission-oriented. We have been slowly reorienting our gaze outward rather than inward. We have fostered a number of new ministries through the formation of Catalyst Groups; we have bolstered the work we do with some long-standing organizations, like the Hillcrest House and The Well; and we have continued supporting other United Methodist projects. All this mission energy has been good for us. But it has also been a little disorienting, as this young member expressed. Some of you have complained to me that it feels like we do a little bit too much, that we have our hands in too many different projects. Others have said they would like to go deeper in their particular ministries, lack the tools and resources to make it happen. This spring, I will offer a class after Wednesday Night dinners to reorient our sense of mission. This class is open to all, and it will be the only class for adults on Wednesday nights, because I would like as many of you as possible to attend. Some of the material might sound familiar to those who have been through Catalyst Training, and there will be some overlap. However, I’m adding new material, and changing much of what I have already taught. Plus we’ll have some guest presenters. You’ll find this to be a helpful refresher course in “how to do mission right,” as I like to put it. The first class takes place after dinner on Wednesday, Jan. 31 at 6:30 pm, and will last for an hour. Please come and participate as we “MAP” out our missions, and learn how to effect creative change in our world. KPUMC is currently undergoing an internal conversation about what to do about the chapel. Wait … did you even know that we have a chapel? On the second floor of the education building, down the hall from the choir room and sanctuary entrance, is a large room with twelve pews and a stage with an altar and lectern. An upright piano sits in the corner next to the stage. In times past, this chapel has served as a place for (very) small weddings and funerals, as well as occasional special worship services, like Blue Christmas or Ash Wednesday. But these days, the only ones using the space consistently are The Kessler School students, who use the chapel to gather in the morning before class. To be honest, the chapel is not currently in very good shape. 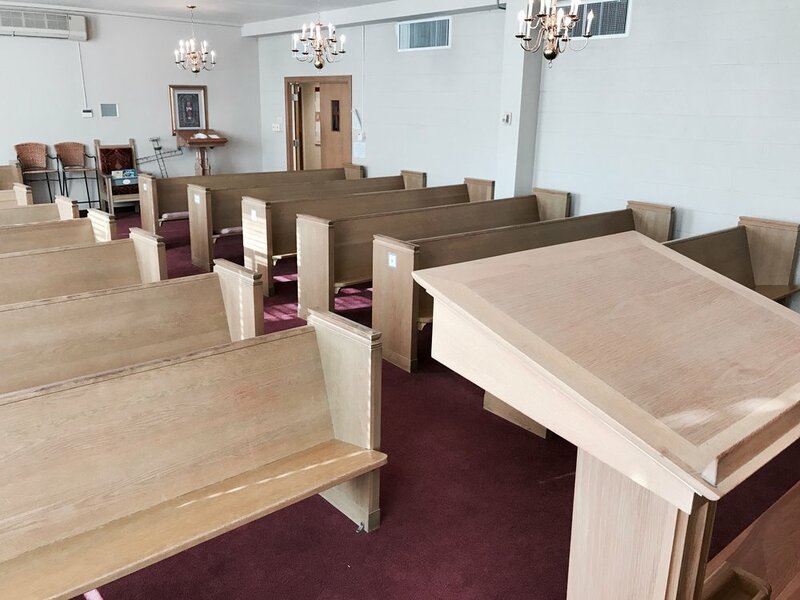 The pews are uncomfortable, and beginning to get a little wobbly. The chandelier lights are the same as we used to have in the old fellowship hall, and just as unattractive. It’s not a very sacred space at the moment. In my opinion, there are three other questions to answer first before we can discern the way forward. Let’s spend a little time reflecting on these. We should begin by asking the question, “How can we love our neighbors better with this space?” Last Sunday, I preached about our neighbors, and I pointed out that, though we understand that everyone could be defined as our “neighbor,” we certainly have to begin by loving the neighbors who live closest to us. So it doesn’t hurt to ask how our chapel space could best benefit the people in our neighborhood. Is there a service or program that we could be offering in that space which we currently aren’t offering? Is there a need that exists in the community which we could meet by using the chapel differently? A second helpful question to ask is, “What could happen here, in this space, that couldn’t happen elsewhere?” This question helps us identify what is unique about a particular space, in order to take advantage of its particular qualities. For example, one helpful feature of our chapel space is that it is on the same floor as the sanctuary. Members of staff have been musing about the possibility of turning the chapel into a Sunday morning welcome and fellowship space, where people could more easily mingle, converse, and have coffee. Some staff have also pointed out that it might be helpful to have a nursery on the same level as the sanctuary; thus, the idea of converting the space into a new nursery has also been broached. Perhaps most importantly, however, I recommend we also ask the third question: “How can this space be used to be a catalyst for creative change in north Oak Cliff?” This question emerged from our Holy Conversations process three years ago, and I find it extremely helpful as we pray and plan for the church’s future. I would encourage us to be creative when we think about this space and its potential. This requires outside-the-box thinking. Could we turn it into a TV studio, where services are regularly broadcast or streamed live? Or a goat yoga studio? Or a coffee shop? Yes, these are crazy ideas … or are they? The point is to spend some time dreaming about what God might be up to in our midst. Why not dream a little, throw some oddball ideas out there? You never know what might stick and catch hold of our imagination. The world is in need of some shalom right now, and we’ve got a big empty space where we might be able to make it happen. The only thing we’ve got to figure out is what and how. Come, dream with us, and let your imagination loose.